There has been little activity in the home kitchen lately because of our recent vacation to Chicago and New York, compounded by the unpredictable timing of our hard wood flooring installation. 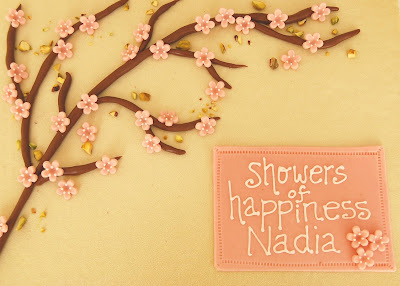 Despite having a large 4-drawer lateral filing cabinet smack in the middle of my narrow galley kitchen, I managed to produce this cherry blossom-inspired bridal shower cake for my dear friend Nadia. We met sixteen years ago as summer students working in the same research lab at UBC, spending many entertaining hours together growing fungus, bubbling agar, and inadvertently killing plants that summer. She even drove me to the police station once so I could file a police report (don't worry, it was nothing serious). Years of pharmacology classes and medical school followed and despite being in different cities during residencies and fellowships, we have always stayed in touch, making Nadia one of the most considerate and reliable friends I have (and without question, the smartest person I know although she will hate me for saying that). Knowing that Nadia likes pistachio, I featured a pistachio mousse and pistachio sponge with layers of vanilla panna cotta, milk chocolate mousse with cocoa nibs, and chocolate cake. 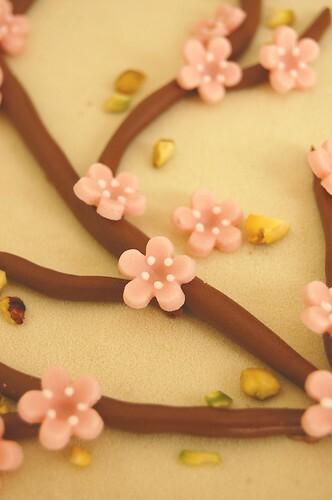 Cherry blossom decor consisted of chocolate rolled fondant branches and pink marzipan blossoms. Vancouver has been unseasonably warm lately and I was convinced that the cake would melt en route to the restaurant in my un-air conditioned black car which normally bakes outside on the street. Luckily, no melting occurred and following a delicious multi-course Italian luncheon, the cake was served and enjoyed (although, thankfully, I was not present to witness its consumption since I had to leave early). 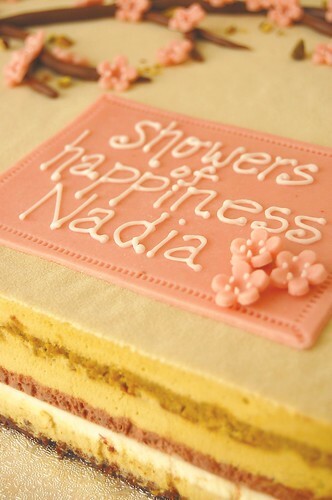 Congratulations Nadia! Posted by Charmaine at 1:01 p.m. Absolutely adorable - I love everything about it, and it sounds utterly delish! July 6, 2009 at 3:06 p.m.
As a cake-maker myself, I can see just how beautiful this is. Congratulations! I'd love to have a friend who made me something so thoughtful. July 7, 2009 at 1:09 a.m.
You did an amazing job! I love how delicious and beautiful it looks! Classic elegance and amazing flavors all together in perfect harmony! July 7, 2009 at 5:07 a.m.
What a beautiful friendship and cake! Lucky! Both of you. July 7, 2009 at 11:22 a.m.
July 16, 2009 at 4:21 a.m.
that looks soooo amazing and SOO yummyy! 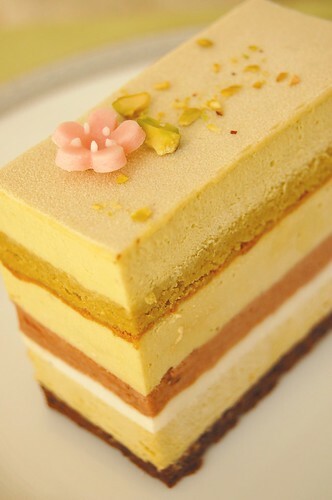 :) You should really post recipes on how to make these multi-layered cakes! I would LOVE to make something like this! July 25, 2009 at 5:24 p.m. Thank you for the amazing truck cake for my son Luke's 4th birthday. In his words it was "perfect". Not only did it look amazing but tasted wonderful. You are a true artist. September 20, 2009 at 10:52 a.m.